or The Tobacco Smoking You? 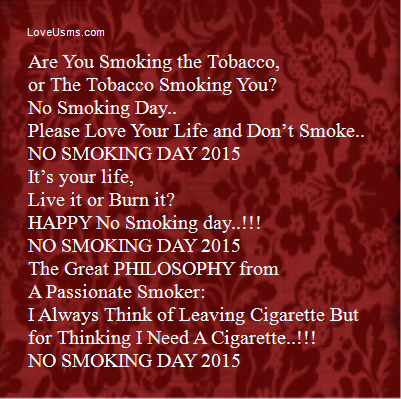 Please Love Your Life and Don’t Smoke..
Live it or Burn it? for Thinking I Need A Cigarette..!!! Khamoshi ko koi samjhe toh maza aur hai. Aunty : Yeh whisper kitne ka hai ? Shopkeeper : 400 ka ..
Aunty : Kitne ka lagaoge ? Shopkeeper : Aunty lagana aapko khud padega.